The daughter of a good customer turned three Jan 2016. She was having a birthday party and invited me. She enjoys watching me work and asks questions so it's not unusual that she did invite me. I immediately began thinking about what sort of birthday gift I could get for her. Considering she's the most darling little girl (and president of my fan club), and I make things, the gift had to be more than a little pink tool belt with pink handled tools. 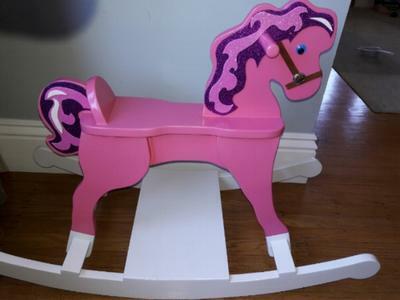 I can't explain the reason, but after a few hours, a rocking horse came to mind. Return to Woodworking Projects Gallery.